If you notice swelling in your feet and ankles, you are suffering from what is medically called edema. Certain medical conditions, including pregnancy or liver disease, and medications can cause edema, along with a diet high in sodium. Treatment requires you first take care of the underlying cause. Limiting your sodium intake can also help by preventing your body from retaining excess water, which can help reduce the swelling of your feet and ankles. When water leaks from the tiny blood vessels in your body, it causes edema. Your kidneys react by retaining more sodium and water to increase the fluids in your blood vessels; however, this leads to more leaking and more edema. Consuming an excessive amount of sodium in your diet also causes your body to hold on to more water, increasing fluid volume, which also contributes to the edema. Choosing lower sodium foods and beverages can help limit your overall sodium intake and help reduce edema. Most grains are naturally low in sodium. To limit your intake, include more whole-grains that have been minimally processed, such as brown rice, oatmeal, quinoa, millet or barley. Read food labels and include other grain products that contain less than 140 mg of sodium per serving, such as bread, pasta and cereals. When preparing your grains, use herbs and spices to add flavor instead of salty seasonings. Fruits and vegetables are also naturally low in sodium and make a good choice when trying to reduce the swelling in your feet and ankles. 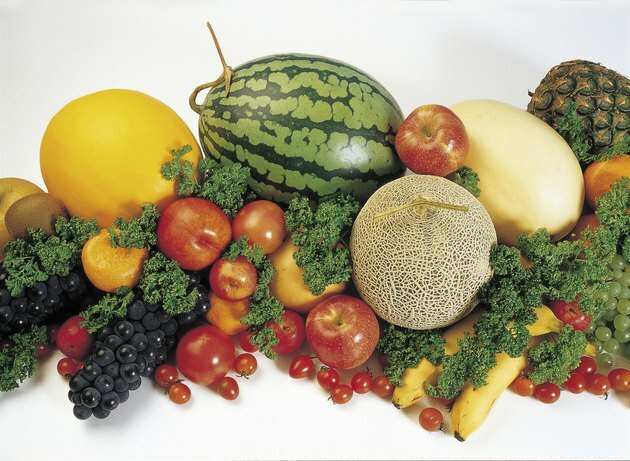 Fresh, frozen, canned and most dried fruits are sodium free. Include more fresh and frozen vegetables to limit hidden sources of sodium that can sometimes be found in canned varieties. You also need to be careful with vegetables with added sauces. Meat and beans are a good source of protein. Sometimes edema is caused by low protein levels in the blood, making it important that you get good food sources of protein in your diet. Include more freshly prepared meats, such as fresh poultry, red meat and fish, and use herbs and spices to add flavor. Many canned beans contains high amounts of sodium; make your own by using the dried varieties to limit sodium intake. Dairy foods are also a good source of protein; however, some dairy products, such as cheese, are high in sodium and contribute to the swelling of your feet and ankles. Read food labels and include only low-sodium cheeses. Milk and yogurt are lower in sodium and make a good choice when trying to reduce the swelling. In addition to choosing more low-sodium foods, you should also omit added salt from your diet when trying to reduce swelling, both during cooking and at the table. Certain foods are also high in sodium and should be omitted from your diet, including ketchup, soy sauce, canned soups, olives, pickles and fast-food. Are There Foods You Can Eat to Help the Swelling of Your Feet?